Belleville's flagship boot, the C390 Men's Hot Weather OCP ACU Coyote Brown Military Boot has provided U.S. troops with dependability and comfort in the field for over a decade. This boot was intended for wear in hot weather environments and is unlined for maximum cooling in temperatures above 100 degrees. It contains a high quality upper made of 100% leather cowhide and abrasion-resistant ballistic nylon. A polyurethane midsole is designed for maximum heel and toe protection during walking, running, and jumping. Bewlleville C390boot is mated to a VIBRAM Sierra outsole that has big lugs which provide ultimate grip on the surface for complete stability. 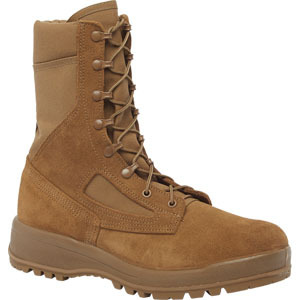 This boot is approved for wear with the new OCP Army Combat Uniform (ACU) and is compliant with AR-670-1. This boot is proudly made in USA and is Berry Compliant. Belleville sizing is way off! On recommendations from Internet reviews, I ordered a full size smaller than my actual foot size. These boots were still way too large. As for comfort and quality they seem pretty good but I had to return them. I've had a tough time finding comfortable boots for my needs. A year ago I had surgery on both feet. Finding shoes and boots that don't give me pain all day has been hard. The Belleville 390 was recommended by a friend and they are my first pair of boots by Belleville. I can walk in these all day with no problems with arch pain or fatigue! I had to exchange my first pair for a smaller because they were too big going from a womans to a mans sized boot. Now there is wiggle room, but not so much that my feet slide around. I'm extremely pleased with these boots! Wore these to work right out of the box. By lunch these were completely broken in like the Nike Running Shoes I have at home! My last pair of Bellevilles I bought about 10 years ago and the quality and comfort are still great. Keep in mind they do run about 1 size large but once you get the sizing down, they are fabulous boots. These Belleville boots have high soles they are very thick and always feel like my ankle is about to roll. After 9 months the soles cracked along the middle of the boot. For a popular brand like Belleville I feel like the quality has gone down over the years. After wearing these for 2 weeks, I can say that they are just like the other pair of Belleville boots I bought several years ago. The quality and construction are first class and they are comfortable right out of the box. No break in. By lunch time on the first day, I forgot I had new boots on. Great boot. I initially bought them for I wear them for work (I work in a warehouse so Im on my feet all day so good footwear is a must). They're so comfortable, I wear them on the weekends now. Great support without and my feet don't get tired at the end of the day like before with the Redwings I had. Make sure to order down one full size from your normal boot size. This is my review as a woman wearing the Belleville 390s for the first time. First of all, the sizeing was a nightmare having to go from womens to mens sizes and also finding out that these boots run really big. I had to order and return several sets of boots before i finally got the size right. Thanks to the guys at bellevillebootoutlet.com for helping me with getting these changed out several times. Despite that, even the correct size for me which was a 5 Reg had too much room in the ankle because when I laced them up and tightened them, the eyelets were pretty much touching and there was still too much room in the boot where my ankles are still loose even with thick socks. Other than that, the boots are comfortable. I just don't think I can run in them because they might fall off my feet. I just bought my second pair of these boots. My first pair was purchased when I was a cadet at West Point three years ago. Let me tell you that these boots have taken a beating. They've been through numerous deployments overseas, Sapper school, and many rucks. I've never even come close to getting a blister in these ever if that says anything to the comfort of these boots. The other thing I'm impressed with is the durability because I've been wearing these pretty much every duty day for the past three years and they've held up real well. I'm a believer. Thanks Belleville for making such a comfortable and good quality boot! Excellent boots for hiking in the California Desert (mainly Death Valley). I bought the full size smaller than my regular size and they fit well. Nice that the tongue design doesn't allow any dust or dirt to drop into the boot. Great boot for hot weather dry climates. After two months, these Belleville 390 boots have been great. Broke in easily after about a week. They feel like my running shoes now. Definitely go with a full size smaller than your running shoe and wear boot socks. These will be the most comfortable boots you'll wear. Incredible how the advancements in boots have made them so comfortable. They've come a long way from the boots I used to wear in the military 20 years ago. ive been wearing bellevilles for the last 7 years. i think they changed the sizing on these becasue they are 1/2 size larger than the last pair i bought. otherwize they are the same good quality and eazy to wear. i work on a constuction site so i need a boot that can stand up to 12hrs of wear at a time. bellevilles definitely fit the bill.